Last edited by t4e; May 17th, 2009 at 12:45.
he changed days of shows now? Sadly I can't be here for the show as I have work, but i'll be downloading later i'm sure! Tuned! 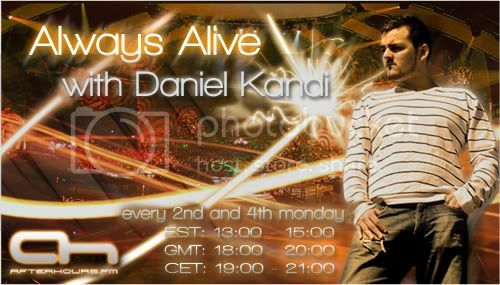 Hope mr Kandi is going to do his usual work... play something HUGE. brilliant prog AAAAAND ALOOOOOT of uplifting for you in the last 1,2 hour! Come often and stay late! You are always welcome here with us!